SO there was this awesome game i used to play for the ps1(play station 1) and i decided to dig it out and play it on the ps2(play station 2) lol. 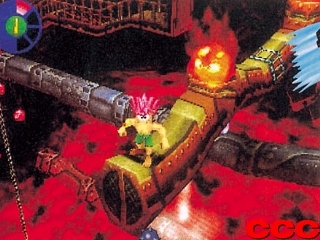 It is called Tomba 2 the Evil Swine. It was the best ps1 game i ever played.I decided to look up some images on yahoo image search of it and came out with this from this part of the game. Im not sure how to get the fire exactly right on the capper and some of the stuff looks alot different probably but im going to work on it. Textures:If anyone can help me with this because they dont really have any good places were i can get textures like this and i want them to resemble the ones in the refference picture. If someone could help me please that would be great! Go ahead and model the whole scene, and then worry about textures. As for the fire, look for some tutorials that deal with controlling particle direction with empties. Its not that hard to digest. Ok ill try to look for that and thanks for the help.Most of the scene is done thats why i was worried about textures. I’m not sure if im going to put in Tomba.I dont thinkk my capabilities are that good yet. Ok i have finished the scene and need some c+c because im not sure if it is good and i need some help with the textures.